At the gate it is unbelievably clear: this is no ordinary dressage stable, but a true paradise for horses and humans. 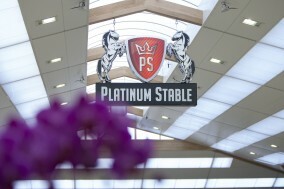 Platinum Stable honors its name and is an oasis of absolute top quality and luxury. The stable in Riel, The Netherlands, is not only ambitious and un-Dutch in terms of accommodation, but also in terms of business philosophy. Early this year Chris and Shirley Wilaras opened their Platinum Stable in Riel, after a very thorough renovation of the existing complex. The couple is from Singapore where they are active as project developers of luxurious holiday resorts. Platinum stable is built at a grand scale, with the thought in mind, that both human and horse are able to experience a high level of comfort. The construction reflects the experience the couple has with building and developing properties for the hotel industry. Everything is made of beautiful and sustainable materials. The whole area is surrounded by colorful flower beds, which can also be found inside the stable complex. Besides the outdoor arena’s, with top quality footing, gorgeous ponds with beautiful fountains are spread across the grounds. In cozy seating areas, both indoor and outdoor, visitors can enjoy the wonderful surroundings that the elaborate complex has to offer. From the top of the beautifully light kickboards not only mirrors rise up, but also a giant size flat-screen TV along the short side. In the winter months the indoor arena is heated. The horses are in light and spacious stables with exterior shutters, but also with a view of the indoor arena. There are solariums available as well as a vibrating plate for the horses. Visitors and staff can use restrooms with toilets that offer a menu of different massage options. Anything you can possibly think of is offered at Platinum Stable. Everything is laid out in balance, built and furnished with light materials of high quality providing great convenience for horse and human. The rules of Feng Shui have been applied; a three thousand year old philosophy that teaches how to adjust your living and working environment to stimulate a harmonious flow, that brings you happiness. The company has only just started, but huge leaps have already been made and currently there are over eighty horses stabled at the yard. The Wilaras couple are only in The Netherlands a few times a year. The couple want to stay in the background and enjoy their horses and stables quietly. Therefore a team of employees is hired in order to take care of the daily stable management. Robin Geelen manages the everyday duties and mainly rides the young horses. The team of riders for the top sport is completed with Tommie Visser, Robin Beekink and Michelle van Lanen. They are supported by several grooms and Erwin Samuels, who takes care of the stud farm management. 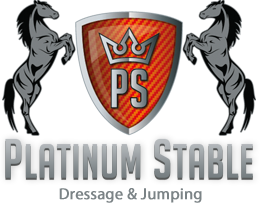 Platinum Stable has two main objectives. Firstly, the ideal of the couple Wilaras is that a bridge is formed between the Dutch dressage sport and the Asian world. On the top of their wish list is winning the Asian Games. Secondly, the main objective is to have their own team of riders perform at international level. Also their own breeding plays a major role in Platinum Stable. For all facets of the company the goal is to achieve the highest possible level, no half measures will be accepted. The idea is that on a regular base a group of approximately twenty riders will come to Riel for several months in order to ride horses that are trained by the Dutch team. Like the Olympics, the Asian Games take place every four years. The level is slightly lower, at Small Tour level. In September 2014 the Asian Games will be held in South Korea, but maybe this edition is just too early. If an appropriate combination can be formed in a short amount of time the option is still open, otherwise we will aim for 2018. The company has just started, but it has already invested extensively in the eighty currently present horses. The majority is bought and there is also a first batch of home bred horses. “A lot of horses and foals were purchased at auctions. There are now seventeen broodmares. They have definitely bought the best mares and invested extensively in top material and blood lines. Eventually they want the best of the best in terms of breeding dressage horses. They breed for their own use in sport here at the yard. Furthermore, there are now ten approved stallions either with the KWPN or in Germany. In the end the sport is the main objective, but sometimes horses will need to be sold in order to maintain a high level of quality”, says Geelen. Sport is the so called main objective of Platinum Stable. The owners do not only want to bring the Asian dressage sport to a higher level. The couple also wants to see their own team of riders performing at the highest international level and with that establish the name of Platinum Stable worldwide. Recently several horses were purchased for that goal. Most of them are still young, so a lot of time will still be going into training. “We have a great team of riders and we complement each other well. We keep each other sharp which is necessary when you want to perform at the highest level”, says Visser. The un-Dutch complex will not have a return on all of its investments, but that is not the intention. “Ultimately, the company has to make money and be profitable, but the buildings and such do not need a return on investment. The income will be generated from both the stud farm and from training Asian riders”, explains Geelen. The Platinum Stable stud station includes stallions which are all owned by the company, such as KWPN approved stallions Ferguson (s. Floriscount), Five Star (s. Amazing Star), Foundation (s. United), Estoril (s. Zhivago), Eye Catcher (s. Vivaldi) and United (s. Krack C). They are accompanied by Oldenburg approved stallions Garuda (s. Romeo), Barchello (s. Belissimo M) and San Fürst (s. San Amour) and Amandari (s. Ampère), approved for Hanover and Oldenburg.